Nao Yoshikawa stays behind to live by herself when her parents leave to inherit her grandpa's farm in the country. On the day she moves into her new apartment she soon discovers that it was rented also to Hisashi Uehara—a cute, super-cool and popular guy from her school. Not only did their housing agency unexpectedly close down, the landlord of the apartment tells them that they had to pay more for their apartment then they had expected. With both no money and no home to return to, Nao and Hisashi decide to live together as flatmates. Good Morning Call was adapted into a live-action TV Drama which released in 2016 and was co-produced by Fuji TV and Netflix. Wow... I'm not sure I've ever read such a mediocre manga before. =( I kept reading, thinking "OK any moment now, the girl is going to mature and stop being so dumb" or... "OK any moment now, the guy is going to transform and become warmer to her" but then before I knew it, I had hit volume 11 and that was it. There was NO CHARACTER DEVELOPMENT at all. AT ALL. Except for the fact that they liked each other, which seemed to be completely based off of teenage hormones and the fact that they lived together. There was never a moment of "Oh, she's actually not so bad because ______" or anything for Uehara. Even the adults in this manga are total kids, like Yuri? "I wanna have an affair"??? Are you 10? If you're looking for romance, don't bother with this one, it's more about school and slice of life than romance, I felt. There was hardly any development between the characters... I think that side couple, Mi(t)-chan and Marina was better off than the main couple. So bottom line was: wow, I can't believe that was 11 volumes and I felt hardly anything happened. And Uehara should wipe that frown off his face, he's handsome except that frown just got really annoying. There was never any kira-kira, beautiful moments were it was like WOW, he really put himself out there for him, the whole manga was very mediocre and anti-climatic. The ending was very cliche as well, but whatever, happy happy joy joy. Cute and funny, Good Morning Call is a manga I'd recommend to any shoujo fan that is looking for a upbeat and lighthearted story to enjoy some time and laugh a little. GMC is the story of Nao Yoshikawa, a 15 year old girl who stays behind in the city when her parents move to the countryside. Excited at the prospect of living alone for the first time, she soon encounters a problem: the apartment where she's going to live has also been rented to a boy, Hisashi Uehara who (of course) is one of the most popular guys at her school. Unable to decide who should keep the apartment (and also faced with a raise in the rental fee), these two decide to become roomates, even though they have nothing in common and didn't even know each other until then. You can probably guess what happens next. I really like the way this mangaka draws her characters, especially when they make silly expressions. The heroine in this is quite silly, but likeable, and her relationship with Uehara provides some really funny situations, most of them thanks to the fact that he is probably one of the least romantic and cheesy shoujo heroes ever. The low point is probably the extension. Most readers might be put off by the lack of real plot in the second half of the series. Some volumes are actually full of fillers that, while funny, don't really bring that much to the story. 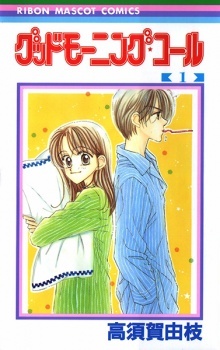 Good Morning Call is the perfect shoujo for anyone in any mood of any kind! Rarely do I get to experience such a fun and light-hearted romance. Though the story is likely never to happen, the relationship contained in it feels very genuine and real for being between two very young teenagers. The story is overall playful. It's a series of twists and turns and this's and that's, creating an uplifting experience for the reader to enjoy! It strays from the usual shoujo path by a fine line, giving you a similar feel to other, more generic series but also providing you with a new type of story to enjoy, as it feels most of the development occurs in the home the two leads have been forced to share. The art was at the top of my list for a shoujo, being of a more bubbly nature. I was also very impressed at how each character was diverse from each other in very real and unique ways! A defect I find in not only shoujo, but in most mangas is a reuse of character design, or a basic "good-looking" outline that is followed, which distracts from personality. The artist did a fantastic job at making each character, large or small, recognizable in such a way that you can tell who they are even years after you have read the story. Good Morning Call is an excellent and warm blend of comedy and love! It's an excellent read for any manga reader- new or experienced. Good morning call is a mediocre manga, one you'll feel like you've read before. I doesn't do anything new, and it will be very forgettable. The story isn't just slow to develop, it never really does. There isn't really a central story being told outside of the "love story" between the two mains. Despite the series being 11 volumes, nothing really happens. Once you start getting towards the end, you'll start having deja vu over and over again, as the author begins to recycle the few things going on outside of the lead characters' apartment. The ending is also very unsatisfying, it's left completely open ended. While it does kinda have a "feel good" ending, it was disappoint to see the author not take advantage of the one piece of plot she was being to write in the last few pages. If you want a manga that had anything near a conclusive ending, this isn't for you. The art is one of the higher points in the manga. It switches between a more realistic art style and a more comical one. I personally did not like the comical one as much, and I wish the author would have used the realistic one more, but I do have to say that it was well done from a technical standpoint. The characters develop exactly the same as the plot, in that they don't. How characters are in the beginning is more or less the same as they are on the last page. They seem to have a few epiphanies here and there, but it never actually goes anywhere. They keep doing the same mistakes, and continue to live their quite static lives. The author also introduced two new comic relief characters towards the end. It's rather strange, as they don't start off as comic relief, it just sort of happens in the following volumes. Eventually, they get an entire chapter devoted to them. It felt very out of place to give such importance to these characters towards the end of the manga, when I felt it should have been climaxing. Once they served their purpose to the plot, they should have been phased out instead of turned into relief characters. The one relief character from near the beginning is also one of the worst in the entire series. The same joke is made about the fact that he can't get a girlfriend is made in what seemed like a majority of chapters, sometimes in the same chapter multiple times. Towards them end I started skipping over sections which contained him, as I literally could not bear to hear the same joke anymore. The manga can be funny at times, especially in the beginning when the jokes are still fresh. Even as I was starting to lose interest in the manga, the author did find a way to keep me going with a few well placed humorous sections. There was also a few moments where I believed a plot was going to form and advance that I really did find myself enjoying the manga. Despite the fact that I was forcing myself to finish the last two volumes, the author did add just enough enjoyment to the rest of the manga to keep me going, hoping that it would get better. Overall, the manga is not bad, but it's not good. If you've got nothing better to do with your time and you really, really like the slice of life genre, then you could find worse. If you are looking for a manga where the romance is more center stage, one with something that could be considered a real plot, or one with deep, developed characters then this one is not for you.